Welcome to the Math Salamanders' Military Time Chart page. On this webpage, you will find a chart to help you to convert from standard to military time, and from military time to standard time. The military time conversion chart below will help you convert from standard to military time and back. In military time, or the 24 hour clock, the hours go up to 24 instead of 12, and the words 'am' and 'pm' are no longer needed or used. The hour is always written as a 2 digit number, so any hour below 10 has a zero before it, e.g. 01:23, or 08:37. On this page, you will also find a quick and easy explanation of how to convert to and from military time, as well as some worksheets for you to try! practice converting from standard to military time. The Military Time Charts in this section will help you to get your conversion facts right. The military time chart below will tell you at a glance how to instantly convert Standard Times to Military Times and vice versa. We have left the colon in our Military times for ease of use, though they are often left out. The formula below will help you to convert from standard to military time. If the hour is 12am, then it changes to 00. Military time is the same as Standard time. Remember to add the preceding zero if the hour is less than 10. Remove the "am" label. If the hour is 12pm, then it stays the same. Add 12 to the number of hours. Remove the "pm" label. This formula will help you to convert from Military Time back to Standard Time. if the hour is zero, change it to 12. Standard time is the same as Military time. Remember to remove the preceding zero if the hour is less than 10. Add the "am" label. the time is a "pm" time. if the hour is 13 or more, take away 12 from it. Write down the new hour and minutes and add the "pm" label. Below are some printable charts that you can use to print out for ease of use when you are travelling around. Sheet 1 has military time on the left hand side, and standard time on the right. There are no colons in military time. Sheet 1A is identical to Sheet 1 but the columns are switched over. Sheet 2 has military time on the left hand side, and standard time on the right. There are colons in military time. Sheet 2A is identical to Sheet 2 but the columns are switched over. Here is our Military Time converter. This converter will change any standard time into military time, and any military time into standard time. Looking for some military time conversion worksheets...? 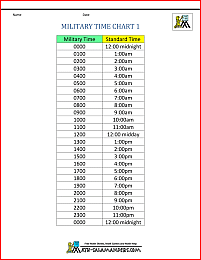 On this webpage there is a selection of printable military time conversion worksheets which will help you learn to convert from 24 hour clock to standard time, and from standard time to 24 hour time. The following web information page is all about converting times into decimals. You will find a Time to Decimal Converter to help you convert times in hours and minutes into decimals. There is also a converter to help you convert a decimal back into a time. If you wish to know how the math works - this is all explained too! The following web information page is all about converting a range of measurements from metric to standard units. Please note that measurements in the US and UK differ for weights and liquid volumes. from metric units to standard units. The following web information page is all about converting temperatures from celsius to fahrenheit. There is a printable temperature conversion page, as well as a formula to help you to convert a range of temperatures.